President Muhammadu Buhari on Thursday in Abuja reiterated the determination of his administration to rescue the remaining Chibok schoolgirls in Boko Haram captivity. The president stated this when he received the rescued Chibok schoolgirl Amina Ali-Nkeki in the Presidential Villa. 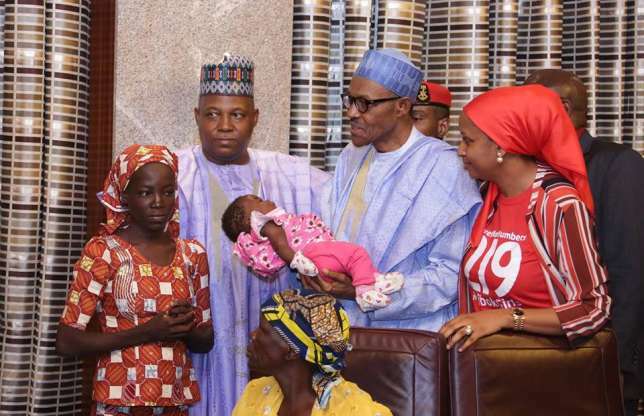 President Buhari, who expressed delight that the schoolgirl had regained her freedom from her abductors, said his feeling was stint with deep sadness over the horrors the girl had gone through at an early stage in her life. According to him, the Federal Government will do everything possible to ensure that the rest of her life takes a completely different course. ``I'm delighted that Amina Ali one of the missing Chibok girl has regained her freedom‎. But my feeling is stint with deep sadness over the horrors the girl had had to go through at such an early stage in her life. ``Although we cannot do anything to reverse the horrors of her past, the federal government can and will do everything possible to ensure that the rest of her life takes a completely different course. ``Amina will get the best care that the Nigerian government can afford, we will ensure that she gets the best medical, physchological emotional and whatever care that she requires to get full recovery and be integrated into the society. ``Rest assured that this administration will continue to do all it can to rescue the remaining Chibok girls who are still in Boko Haram's captivity. ``Amina's rescue gives us new hope‎ and offers a unique opportunity to vital information,’’ he said. He further assured that the continuation of Amina's education, which was abruptly disrupted, would be given greater priority it deserved by the federal government. ``Amina must be able go back to school. Nobody in Nigeria should be put through the brutality of forced marriage; every girl has a right to education and their choice of life,’’ he added. The president noted with delight that the rescued girl had undergone thorough medical examinations by medical personnel from government and other Non-Governmental Organisations. He disclosed that the rescued girl was examined for about five hours by the medical personnel and trauma experts from UNICEF. 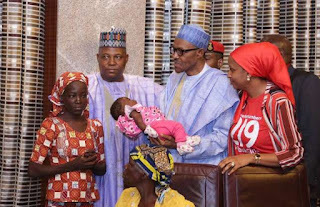 President Buhari pledged that the federal government would assist the Murtala Mohammed Foundation which had been providing support for the families of the missing Chibok girls. According to the president, the foundation, which runs a trauma and counseling facility in Kano, will also be involved in the ongoing monitoring of Amina’s progress and any additional support she requires. The mother of the rescued girl, who spoke through an interpreter, thanked all those involved in the rescue of her only surviving daughter (out of her 14 children).